The discussion has been raging on for a while, and the point of this post isn’t to add to it; I have bigger fish to fry. If you’re interested, I encourage you to read Peter Knight’s comment on WP Tavern, which eloquently distillates my own thoughts on the whole debacle, much better than I ever could. To be clear: none of them think this is a bad idea, per se, conceptually, but every single one of them hates the implementation. Some because it’s confusing (agreed, those are easy to retrain, with patience), others (more technically inclined) because they’re horrified at how this will impact the development teams’ workflow (oh look, we need React developers now), some because it isn’t accessible (goodbye government work for me), and even a few because they can’t see the point of turning their installation into Squarespace or Wix, but with less functionality. To those concerns, I would add my own, of lesser concern to them: the politics of it all is horrid, and is fracturing a community on whose shoulders WordPress’ success was built. people are in dissonance over WP decisions (ship Gutenberg at all costs) not following WP values (design for everyone, emphasize accessibility). we assume decisions stand on values. and they just don’t in WP. values are used to decorate decisions after the fact, not shape them. I use the Advanced Custom Fields plugin extensively. It’s robust, well coded4, well documented, and well supported. What money I’ve spent on a Pro license, has paid itself several times over. To me the only downside, if you can call it that, is that it adopts the “Custom Fields” nomenclature in its name, clearly a developers idea of how to describe “Content Attributes”. ACF is, to me, what the implementation of those attributes should always have been in WordPress core, short of a normalized database design5. 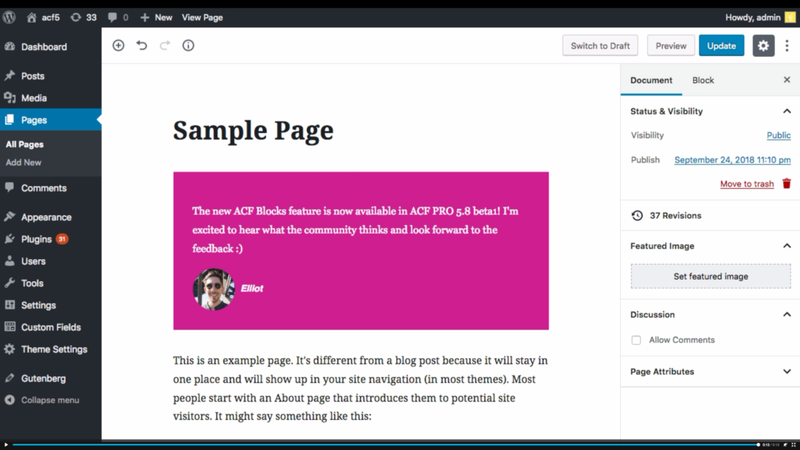 Its developers have done a brilliant job of keeping pace with the development of Gutenberg, in a sensible, level-headed way, making sure that all those who depend heavily on the plugin6 aren’t left hanging after an upgrade to WordPress 5.0, which may have looked like a catastrophe to intricate installations. All in all, once again, this feels very much like part of how I’d implement blocks in core in a sensible way, but “sensible” doesn’t seem to be a very popular word in WordPress core these days. That said, I’m not a core developer, which appears to disqualify me from expressing an opinion at all. In short, thank you Elliott, for all the hard work; it has not gone unnoticed.